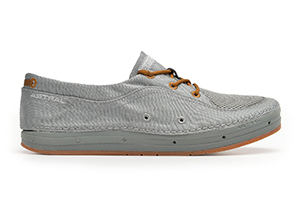 Our version of the classic boat-shoe is built with modern materials and designed for high performance. The Porter provides amazing grip on deck, an active heel lock, water drainage, and ventilation. Its hydrophobic canvas uppers dry fast and endure years of sun and saltwater. Send me an email when the Porter Men's is available please! Uppers: Hydrophobic Canvas with 2 mm Airmesh at tongue and vamp for ventilation. Slit at heel for debris drainage. 210D nylon liner, water resistant shoelaces. 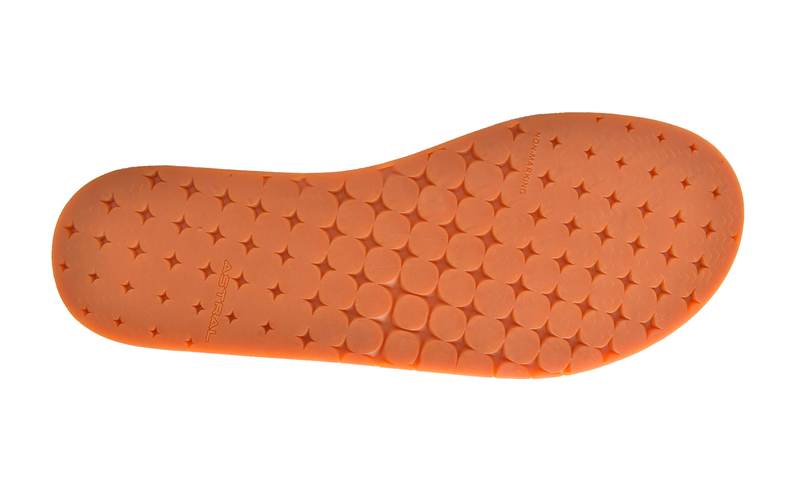 Outsole: G.15™ high friction G®Rubber compound with razor-siping and maximum surface contact, ideal for boats. Maximum sole-to-surface contact for highest friction on smooth surfaces like boat docks, rafts, tile floors. Razor-Siping increases quantity of edges that “bite” into a surface. Thin profile provides excellent feedback, and enhances grip and balance. I cant believe how much I love these shoes. Ive worn them every day for the last year at work and around town and the insole and outer rubber still feel almost new. Im usually very hard on shoes, and these are holding up better than any pair Ive ever had. The grip they offer is incredible (I teach in a school where the climate control is less than excellent, so the floors are often super slippery) and they still grip like they did day 1. I live in New Orleans, so heat, sweat, and water are the norm, and these have handled all of that funk free. Keep up the good work astral. Im looking forward to trying the brewer 2s if I can ever kill these! Let me start by saying that I am horrible on shoes. Im a bigger guy and tend to wear out shoes super quickly. These have been incredibly durable. The integrated insole hasnt worn down at all, and the outer rubber (which I was worried would wear out fast because of how sticky they are) still grip like they did the first day and show little signs of wear. I live in New Orleans, so heat, sweat, and water are a constant for me, and these shoes handle all of it without any funk. Ive worn them every day for the last year and cant see needing to replace them anytime soon. I have had the Porters for 3 years and it has become my daily shoe year round. This shoe has it all! The comfort and durability can't be matched by any other brand. I also have a pair of the Brewers and love them as much as the Porters! There reached a point for me some years ago when I realized that the best kind of shoe is the one that fits so unobtrusively that you barely know you're actually wearing things around your feet. I am constantly on the search for shoes that fit that description, and these Porters absolutely do. They stylishly form around your foot and provide solid support for your daily travails. I only use these for daily wear, and they're perfect. Very nice shoe to wear all year round. A great shoe for kayaking and fishing in the summer as well as for going out on the weekends. I even wear these in the winter since they are so comfortable and convenient. Worn with or without socks, both feel great. Could not be happier with this purchase. 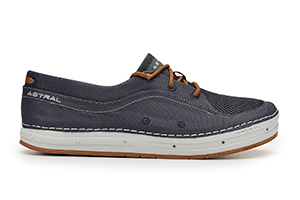 Very stylish boat shoe with great features. Comfortable. I wear them without socks, not as hot or stinky as traditional leather boat shoes. Perform great on the water, good looking enough to wear as a every day casual shoe. 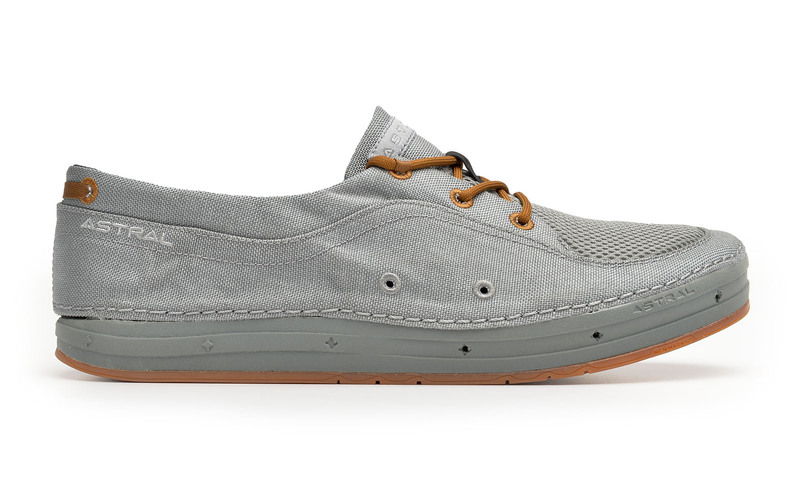 Highly recommend to anyone looking for a updated non-leather version of the traditional boat shoe. I bought these shoes to wear on my Hobie Cat sailboat. However, I've found myself going to them on just about any casual outing (restaurant, bars, etc). They dry out very fast. I rinse them in the sink after and day on the lake, then let them air dry I the house. They do not stink after being water logged (so far)! Excellent grip! I actually put them on to fix a leak on my roof during massive down pour; I didn't slip once. Give them a couple weeks for break in, mainly for roughing up the skin on your back heel. Overall, great shoes. Performance and style in the same package. submitted by: Max Allen, Tennessee!! This shoe is fantastic and extremely versatile. I try to minimize wearing socks when possible but fear the stink it can bring to my feet. I have worn these a ton since I bought them a few months ago and haven't had any odor problems as they breathe extremely well. The grip on the soles is outstanding which makes them very versatile for light hiking, walking the beach or taking them in the water. They also are sharp looking enough to wear out to dinner or have a drink at your local watering hole. They have held up extremely well and would definitely encourage those to buy them if you are on the fence, you won't be disappointed. Quality shoes. Love it. Got to use it for the first time yesterday. Worked perfectly. Better than booties for circulation. I've had the current pair for a number of years, time to get a new color, they look great and I can wear them anywhere. Very functional and versatile. Astral nailed this one. As a charter captain in Charleston SC I spend a lot of time on my boat and can't imagine not having these. The G-rubber is for real and is also non-marking. That combination is perfect. Quick drying fabrics and flush ports keep your feet dry. They are pretty stylish too I might add. I have one in each color if that says anything. So excited to try their new TR series. Definitely would recommend this product to all boaters and Waterman. Nice job guys! Finally, a real boat shoe for Small Craft! These are what boat shoes should be! I have been wearing leather boat shoes for casual wear for 30 years. Would I wear leather boat shoes in a canoe or a kayak? No way, they would get wet and stay wet, be loose and start to smell like a wet dog chew toy so the old leather boat shoes have been regulated to casual wear for me, since I mainly like small boats. 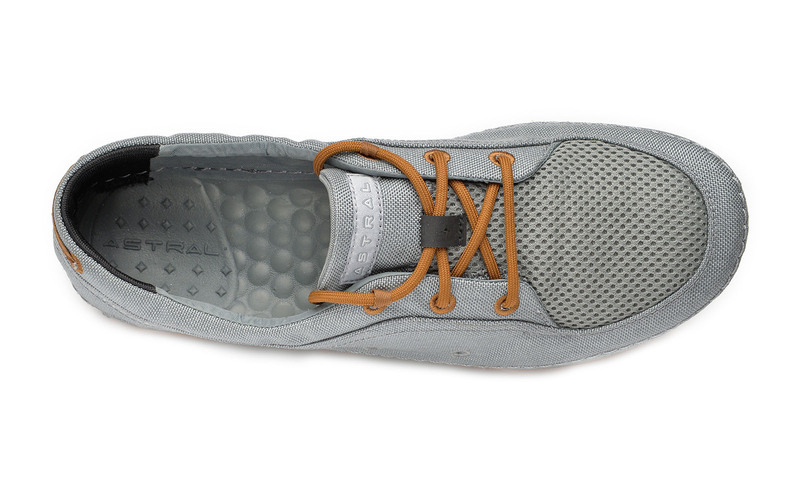 Now these Porters are what a small boat shoe should be, nylon for wear and ease of drying, super sticky soles and the laces actually work to keep the shoe on your foot. Fantastic and good looking too! I have wider feet and these fit me well, they are light and pack into almost nothing, so they travel better than the my old leather ones too! 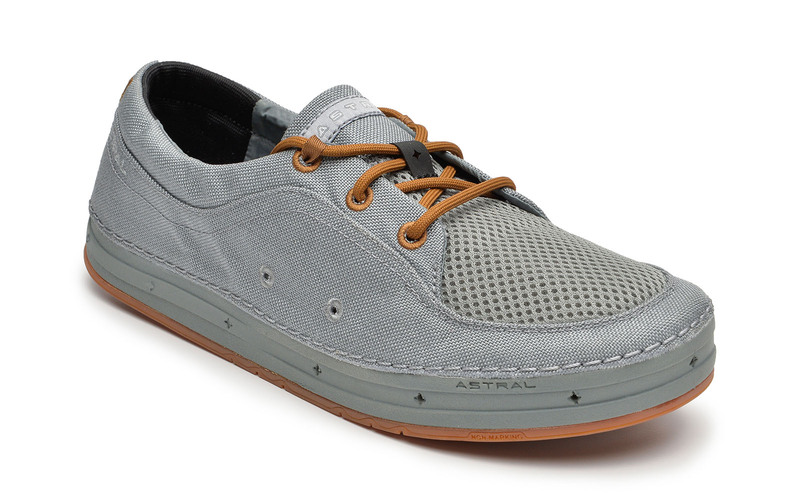 I have found my actual boat shoes with the Porter This is of course after moving to the desert SW Still awesome casual shoes and will be with me in travel as well, thanks for updating a classic shoe for us Astral! These are some amazing shoes. I have had my pair for over 2 years and they have held up extremely well considering the abuse I have put them through. I wear them daily as a casual and comfortable shoe for most of the year. I also wear them as my main approach shoe for climbing. Granted, the approach is mainly under a mile on a trail with some rock and stream crossings. The drop down heel is perfect for slipping on and off at the crag and I lace them up for a tight fit when I have to walk out and some casual climbing is required. They breath extremely well in the summer and are perfect when the water is higher. Obviously, these are not meant to be winter shoes and without a full upper you would not think them ideal for too much other than casual wear. However, they perform extremely well and the lacing system which tightens around the heel keep them snug and prevent your heel from popping out. Cleaning is easy. I throw them in the washing machine when they get too dirty and smelly, sometimes with a little detergent but mostly without, and let them air-dry. If/when these shoes finally wear out, I will be buying another pair immediately. I stopped into Tops on Lexington Ave. on my recent engagement celebration trip to Asheville looking for a breathable and supportive shoe to replace my Vasque hiking boots during the hot months. I saw Astral's tan and black Porters and it was love at first sight. I tried them on, loved the feel and purchased them. Walked for the next few hours up and down the hills of Asheville and the shoes kept feeling great. Great to have a lightweight shoe with arch support that you can feel the breeze through during the hot southern months.